Charm, epoxy and gold-plated aluminum, teal, 15x9mm single-sided awareness ribbon. Sold per pkg of 6. Item Number: H20-A1159FN Have a question about this item? Show your support for a cause with this gold-plated and colorful epoxy awareness ribbon charm. Many charity organizations have adopted colored ribbons as symbols of support. To see the many causes represented by this ribbon, view the Awareness Ribbons: Color and Cause Guide. 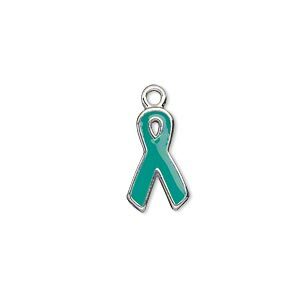 Charm, silver-plated aluminum and epoxy, teal, 15x9mm single-sided awareness ribbon. Sold per pkg of 6. 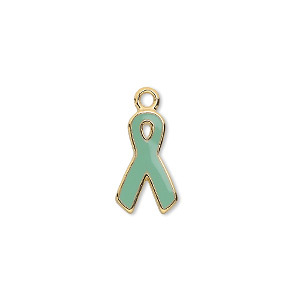 Charm, epoxy and gold-plated aluminum, green, 15x9mm single-sided awareness ribbon. Sold per pkg of 6. Charm, epoxy and gold-plated aluminum, purple, 15x9mm single-sided awareness ribbon. Sold per pkg of 6. Charm, epoxy and gold-plated aluminum, red, 15x9mm single-sided awareness ribbon. Sold per pkg of 6. Charm, epoxy and gold-plated aluminum, yellow, 15x9mm single-sided awareness ribbon. Sold per pkg of 6. Charm, epoxy and gold-plated aluminum, white, 15x9mm single-sided awareness ribbon. Sold per pkg of 6. Charm, epoxy and gold-plated aluminum, orange, 15x9mm single-sided awareness ribbon. Sold per pkg of 6. Charm, epoxy and gold-plated aluminum, black, 15x9mm single-sided awareness ribbon. Sold per pkg of 6. 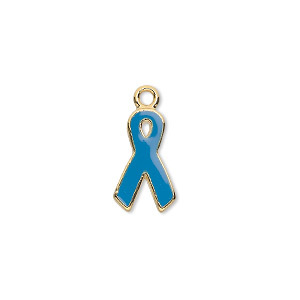 Charm, epoxy and gold-plated aluminum, blue, 15x9mm single-sided awareness ribbon. Sold per pkg of 6. 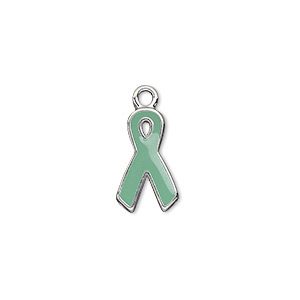 Charm, silver-plated aluminum and epoxy, green, 15x9mm single-sided awareness ribbon. Sold per pkg of 6.